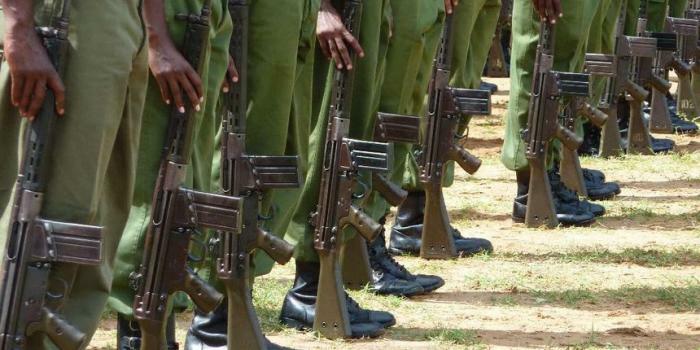 Two APs from Witeithie AP post are nursing injuries after they were attacked by people suspected to be touts at Witeithie stage in Juja Sub-County of Kiambu this morning (Saturday). The cops had entered a tea shed and before they made their order, a group of young men baying for their blood arrived. According to an impeccable witness, one of the officers had his legs swept by one of the attackers. As he fell, the attackers descended on him with kicks and blows. The other officer who was in the tea shed was hit with a devastating blow that cut his lip leaving loosened teeth. The witness said the man who hit the officer, challenged him to identify (mark). “Mark me very well. Am not afraid of you at all. Am a matatu crew here,” he shouted to the profusely bleeding AP. Later, the officers were taken away in a land cruiser after they were rescued by colleagues. Following the attack, a swoop led by Witeithie AP post boss, inspector James Dawai was conducted in which several touts were arrested and are now assisting police with investigations. One of the officers said during the attack his phone was stolen. It s believed that the touts might have been revenging the previous day's arrest of several touts at the stage by the officers.